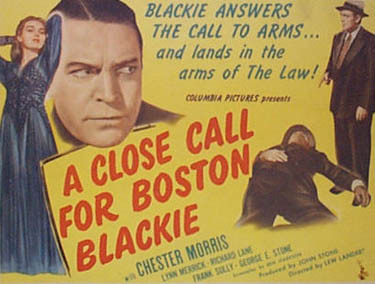 This is the tenth movie in the Boston Blackie series. Blackie is framed for murder by a beautiful dame. 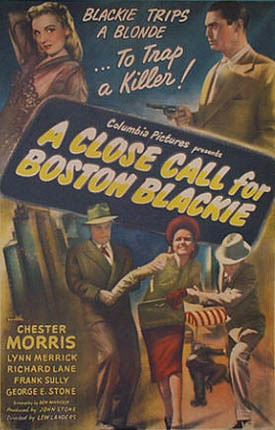 Blackie runs into a woman he formerly loved, Gerry Peyton, who now is married with a child. When her husband, John Peyton, the son of millionaire Cyrus Peyton, gets out of prison and he's killed in Blackie's apartment, of course the police think Blackie is the one that shot him. Blackie must now set out to prove his innocence as well as capture the real killers. Things get complicated when it turns out that the child is not Gerry's and she tries to ransom it to John's father. Blackie decides to impersonate Cyrus Peyton to catch her and her accomplices. It all ends with the normal amount of action we expect from Blackie, only this time Farraday gets a chance to teach Blackie a lesson about becoming involved with shady women. Art Director: Carl Anderon and Jerome Pycha Jr.
Boston Blackie comes to the aid of his former sweetheart Gerry Peyton when Gerry begs him to protect her and her baby from her recently paroled husband John. Peyton, the son of millionaire Cyrus Peyton, had been jailed several years earlier for manslaughter, and Gerry confides that she never informed him or his family about the birth of their child. When Gerry mentions that Peyton has threatened her, Blackie phones Inspector Farraday of the police department, and at that moment, Peyton bursts into the room, gun in hand. After Blackie wrestles the weapon from Peyton, a man shoots from the doorway and kills Peyton. Soon after, Farraday arrives and Blackie orders his sidekick, The Runt, to spirit Gerry and her baby out the back door. When Farraday discovers Peyton's dead body stuffed in Blackie's closet, he arrests Blackie for murder. 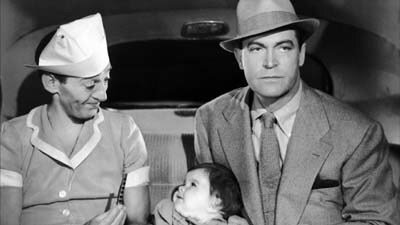 After leaving The Runt and the baby at the apartment of The Runt's girl friend Mamie, Gerry, who has been lying about her motherhood, visits her accomplices to discuss their a scheme to extort money from her wealthy father-in-law. Smiley, one of her confederates, is the man who killed Peyton, while the other one, Hagen, has allowed Gerry to present his baby as the elder Peyton's grandson and demand a handsome sum for his return. After escaping from Sgt. Matthews, Farraday's assistant, Blackie rejoins The Runt and the baby. 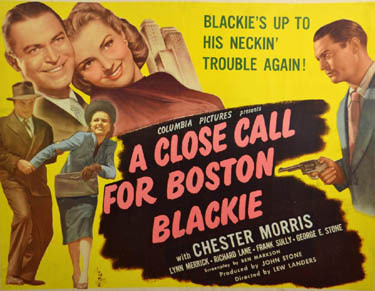 From the switchboard operator in Gerry's building Blackie learns that Gerry directed Peyton to meet her at Blackie's apartment, and he becomes suspicious of Gerry's motives. When Farraday questions Gerry at police headquarters, she claims that jealousy drove Blackie to kill her husband. Farraday then introduces Gerry to Cyrus' lawyer, Harcourt, who explains that his employer had received a note that very morning informing him that he has a grandson. 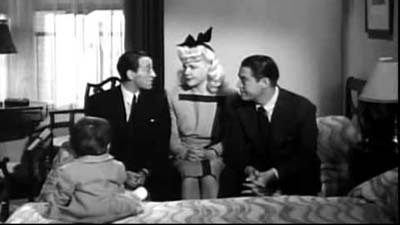 Deciding to return the baby, Blackie takes him to Gerry's apartment just as Farraday arrives with Gerry and Harcourt. After stealing the note from Harcourt's pocket, Blackie escapes the inspector's clutches once again. Upon reading the note, Blackie realizes that Gerry is planning to extort money from her father-in-law and decides to pose as the elder Peyton, arranging to meet Gerry, who has never met Cyrus, at her apartment. While waiting for Cyrus, Hagen balks at going through with their scheme and Smiley shoots him. Soon after, Blackie arrives, posing as Peyton, and asks to see the baby's birth certificate. When Blackie challenges its validity and threatens to call the police, Smiley appears, gun in hand. In the ensuing fight, Blackie disarms Smiley just as Farraday appears and Gerry and Smiley claim that Blackie had been threatening Gerry. After releasing Gerry and Smiley, Farraday arrests Blackie and accompanies him to the lobby. There, Blackie is surprised to find Gerry and Smiley handcuffed and in police custody. Farraday then explains that although he knew the two were guilty, he wanted to teach Blackie a lesson about becoming involved with shady women.